당나라 현각(玄覺)이 지은 증도가는 선종(禪宗)사상을 칠언시로 지은 것으로 우리나라에서 가장 많이 유통된 선수행의 지침서이다. 이 책은 닥종이에 찍은 목판본으로 현각의 누이인 정거가 본문의 내용을 알기 쉽게 풀이하여 하나의 책으로 엮은 것이며, 크기는 세로 25.3㎝, 가로 15.7㎝이다. 책 끝부분에는 고려 선종 6년(1089)에 보제사(普濟寺)의 스님들과 일반인들이 함께 발원(發願:시주한 사람들이 신령과 부처에게 소원을 빎)하여 간행한 것을 기해년(己亥年)에 문림랑사재소경(文林郞司宰少卿)으로 있던 이시무가 다시 간행하였다는 기록이 있다. 기해년이 언제인지 확실하지 않으나 문관종9품의 등급인 문림랑이 충렬왕 34년(1308)에 통사랑(通仕郞)으로 고쳐졌으므로 늦어도 충렬왕 25년(1299)의 기해년일 것으로 추정된다. 이 책은 고려시대에 간행된 판본일뿐 아니라 현각의 누이인 정거가 풀어썼다는 점에서 그 가치가 크다. Composed by Yongjia Xuanjue, a Buddhist monk of the Tang Dynasty, Yeongga Jingakdaesa jeungdoga (Song of Enlightenment) is the most popular guidebook for Zen training containing heptasyllabic poems about the philosophy of Zen Buddhism. 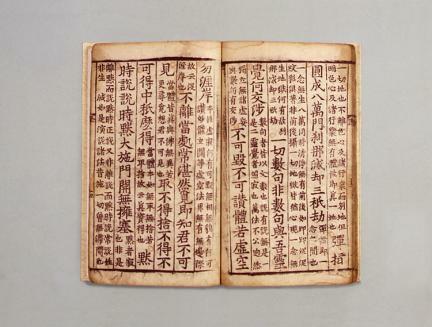 Printed on mulberry paper by woodblocks, this book measures 25.3cm long and 15.7cm wide. Jingju, the sister of Yongjia Xuanjue, annotated the main texts. 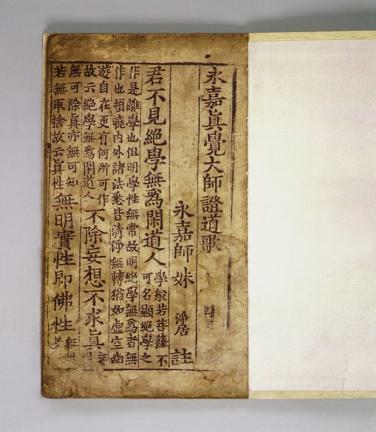 The record on the last part of the book states that this book was initially published in 1089 (sixth year of the reign of King Seonjong of the Goryeo Dynasty) when the monks of Bojesa Temple and the people believing in Buddhism held a rite together, and that it was republished by Yi Si-mu in the year of gihae. It is uncertain exactly when the gihae year is, but it is presumed to be 1299 (25th year of King Chungnyeol’s reign). 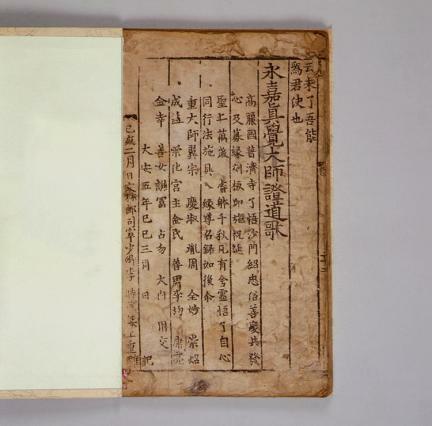 It is deemed valuable since it is a woodblock-printed book published during the Goryeo Period and explanatory notes were added by the author’s sister.